Vienna, Nel 1853 fallì l'attentato di un anarchico all'imperatore Francesco Giuseppe I. Per ringraziare per la sua salvezza si costruì la chiesa votiva in stile neo-gotico " Per il divino Redentore" (1856-1879). Jim (Homepage) wrote: Impressive. 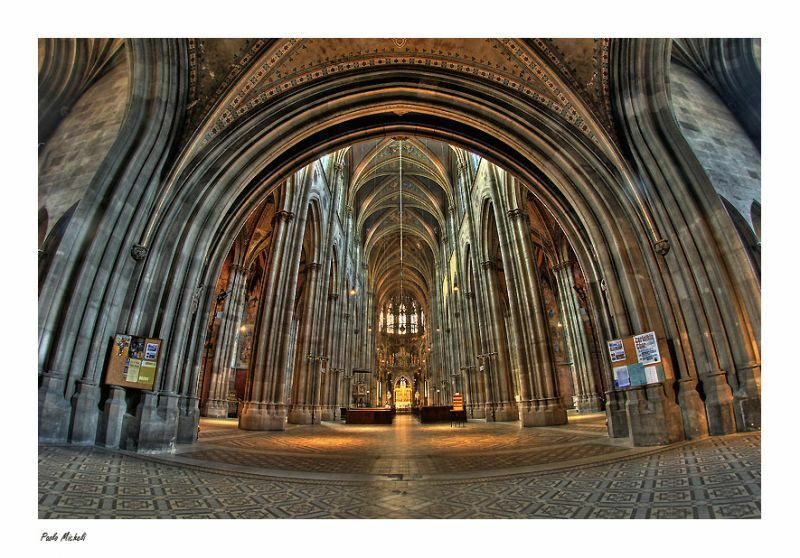 The wide angle really accentuates the arches and focuses the eye down the aisle of the cathedral. sherri (Homepage) wrote: Such an ornate structure with beautiful colors. I love the capture...it's incredible. Frank (Homepage) wrote: Great! I like the golden light. Excellent. beanow (Homepage) wrote: Wonderful architecture - the bead!!! Michael Rawluk (Homepage) wrote: The curve really accentuates the beauty. Wonderful. Marcie (Homepage) wrote: WOW! Love the wide angle view..or is it fish-eye??? Whichever..it really allows for a terrific image. don (Homepage) wrote: A beautiful shot of this interior with fine detail and such appealing color. Even the lens distortion enhances the shot (for me). Excellent image.